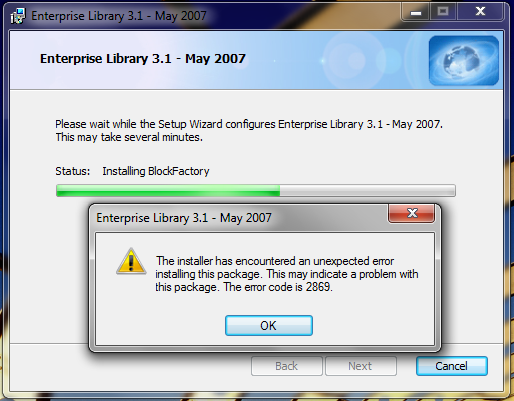 Yup, there could be errors like the below image while installing “Enterprise Library May 2007.msi”. The reason I found for this is, this enterprise library version checks for Visual studio 2005 is installed in the system, though Visual studio 2008 is installed. I have just installed VS 2008 in my system and thus facing the same error. 1. Install Visual Studio 2005 and then install this “Enterprise Library May 2007.msi”. –>> Don’t waste time doing this. The latest version of Enterprise library will install perfectly with out any installation errors.